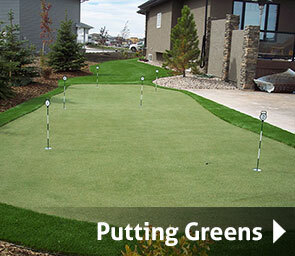 Edmonton’s best artificial turf and putting green installation. 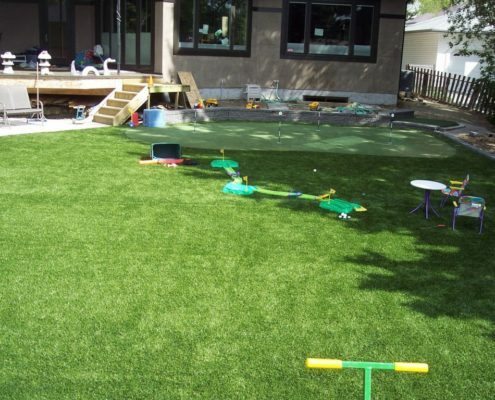 The best artificial turf installations in the Edmonton area. 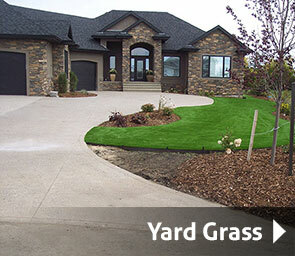 Information for DIY and landscapers anywhere in Alberta to buy wholesale turf. 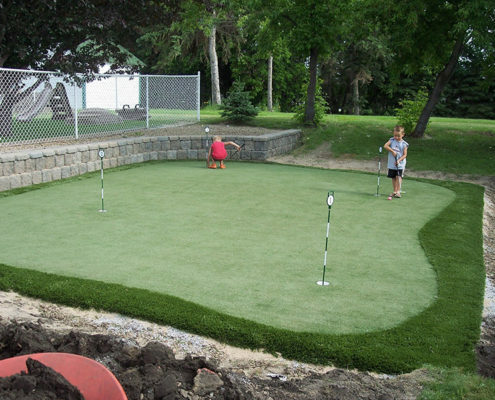 Click here for information to buy wholesale turf. 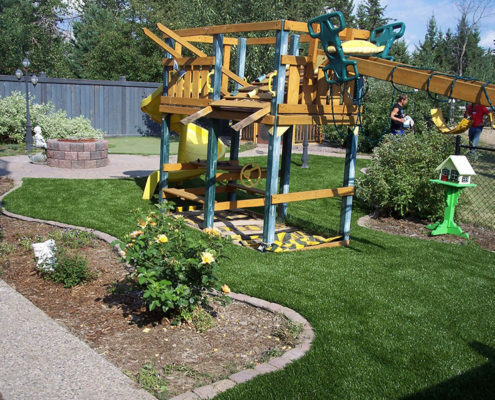 Beautiful year round artificial turf for your front and backyard in Edmonton, Sherwood Park and surrounding areas. 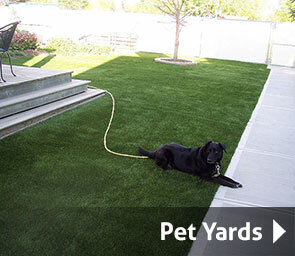 Artificial turf that is durable, easy to clean and pet friendly. 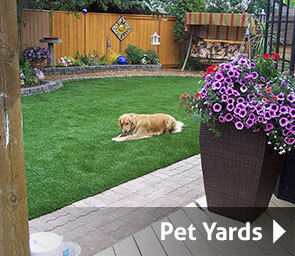 We install full backyards and dog runs. 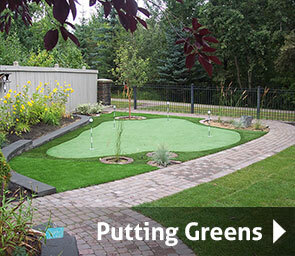 Amazing backyard putting green installation and design in Edmonton, Sherwood Park and surrounding areas. We offer financing with no upfront fees and no penalty for early payout. Great rates, long terms and low payments. Zero down-payment. 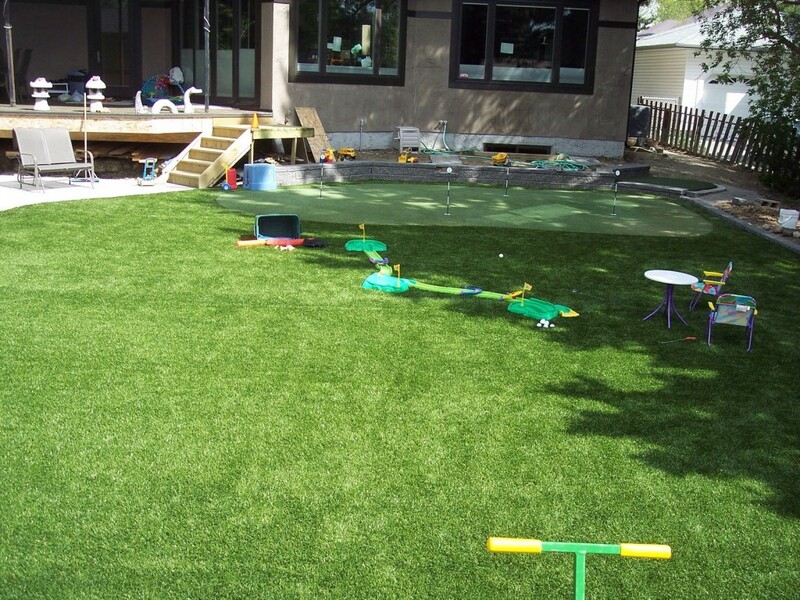 Turf that looks and feels like real grass, soft polyethylene fibers with thatch and more resilience (springback). 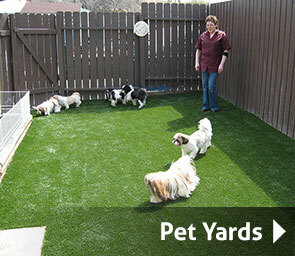 We make yards fun and have this as part of our core values. 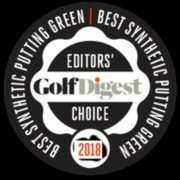 As an avid golfer, Gary Selanders, discovered Southwest Greens and felt that families and businesses throughout Alberta could benefit from this wonderful product and began a distributorship in 20?? The affordable nature and smart innovations mean that families, golfers and businesses can focus on what they want to do more and more. Peace of mind is more valuable than ever; no bugs, no watering or mowing, knowing we’re bettering our planet – these are the qualities that drive deep customer satisfaction. 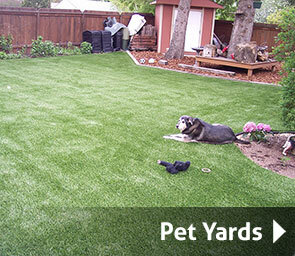 Easy to clean, pet friendly artificial turf that is long lasting and beautiful. 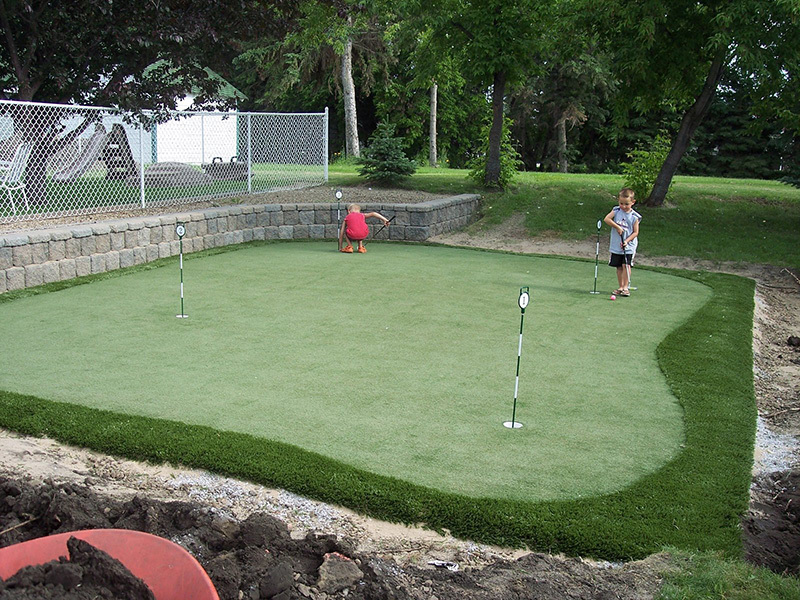 Amazing backyard putting greens that meet the very highest standards in the industry. 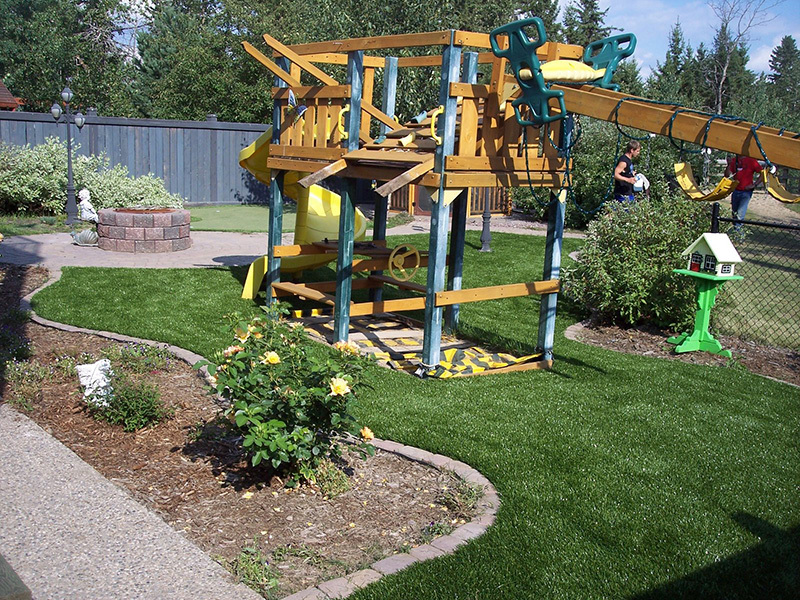 Durable 4 season play areas for your home. Adding value to your commercial and condo development. 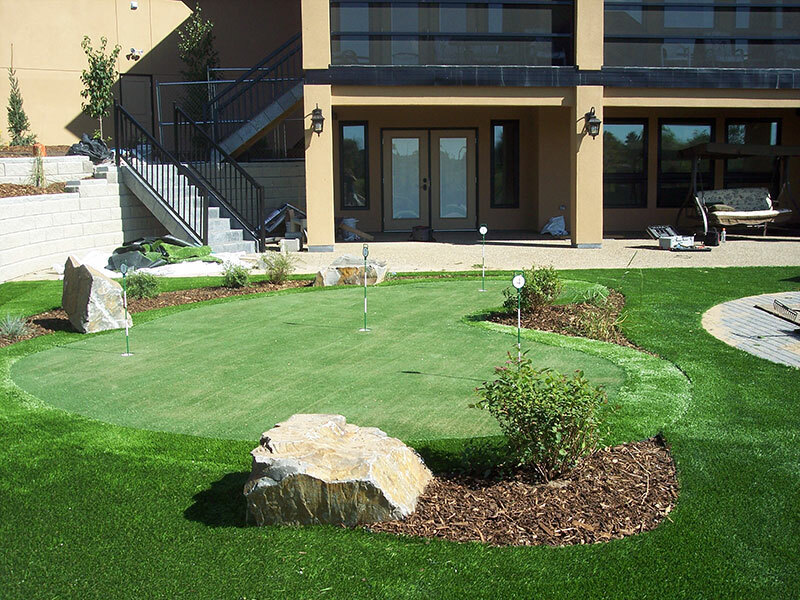 Durable and beautiful golf course turf installation. 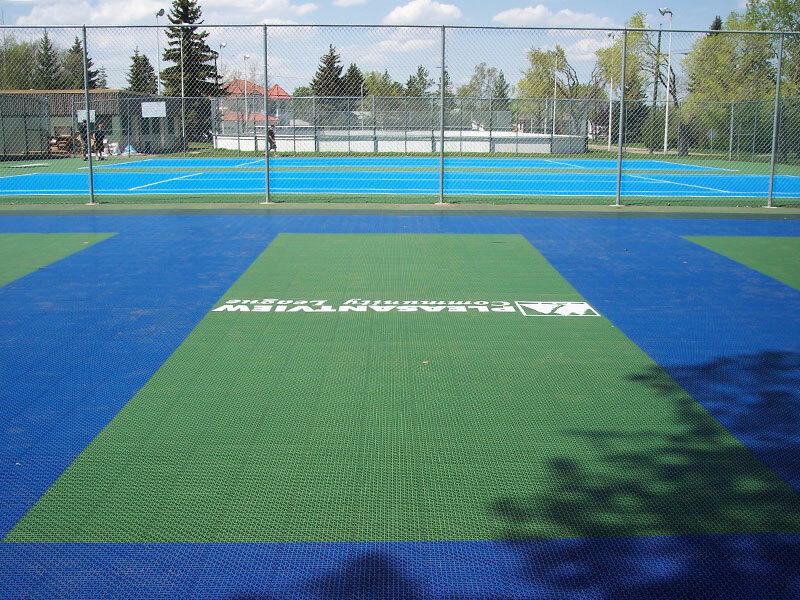 State of the art VersaCourt installation. The best aesthetically pleasing yard with no work. 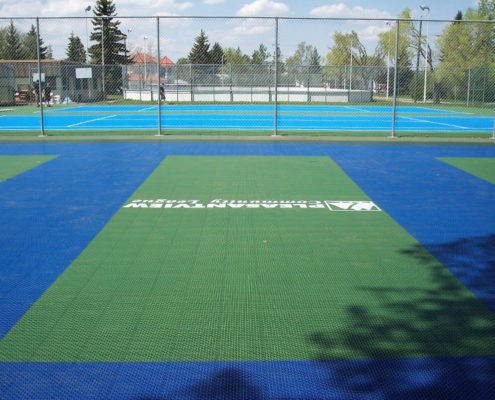 Soccer, tennis, indoor or outdoor we have the turf for you. Evergreen Turf did an amazing job for us last summer. Gary and his crew were on time, completed the project in the time quoted and the price was great. We love our new lawn and backyard. They even added extra cushioning under our son’s playset, which gives us more peace of mind when he’s playing. Wonderful company! 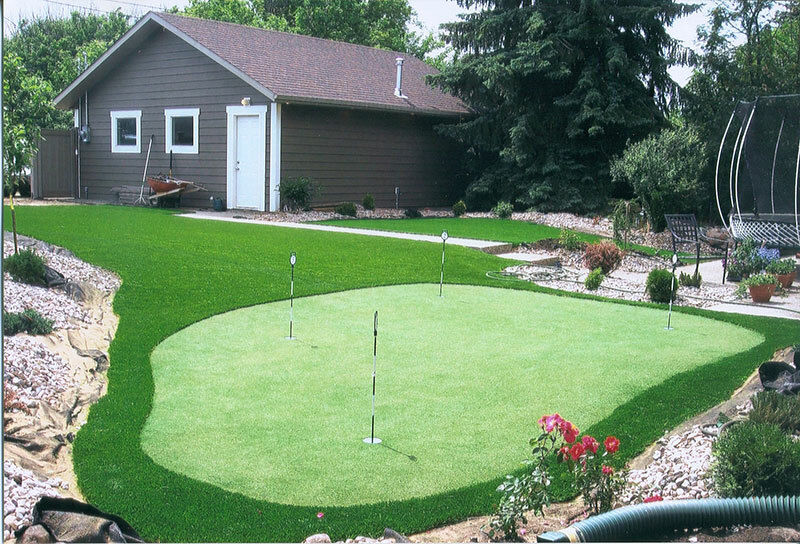 Gary and Evergreen Turf has completed three residential lawns and putting greens for me. Gary and his crew have done each property exactly as promised with no complications. His crew works efficiently and on time. 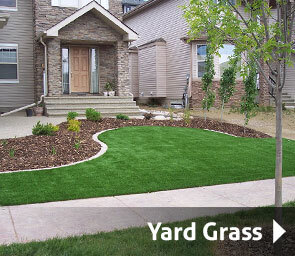 The product that Evergreen uses is also superior in comparison to many neighbouring artificial lawns. It looks more natural than most I have seen. I really don’t understand why people put in natural lawns anymore. I just sit back and relax all summer with little too no yard maintenance. It is worth the extra expense in the long run. It is also great for pets and stays green all year. The putting greens have also helped with my handicap. 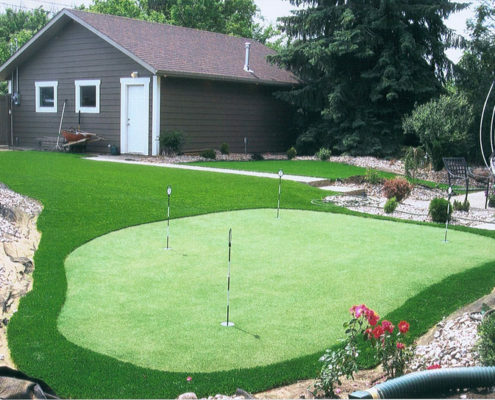 If you are in the market for a artificial lawn I would highly recommend Gary and Evergreen Turf. 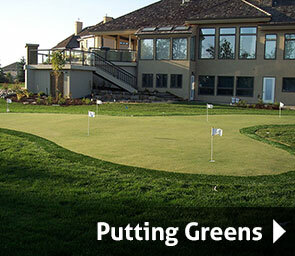 We love our turf and had a great experience with Gary and his staff at Evergreen Turf. 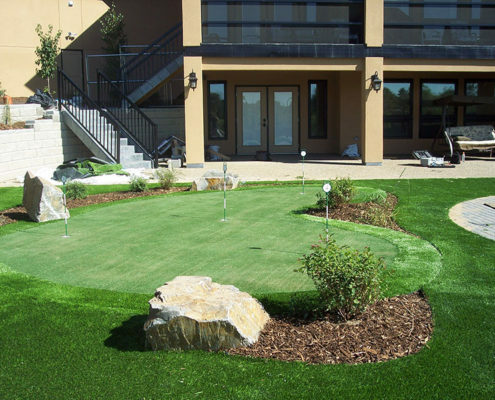 Our turf always looks amazing and requires next to no maintenance and it enhances the other aspects of our yard. 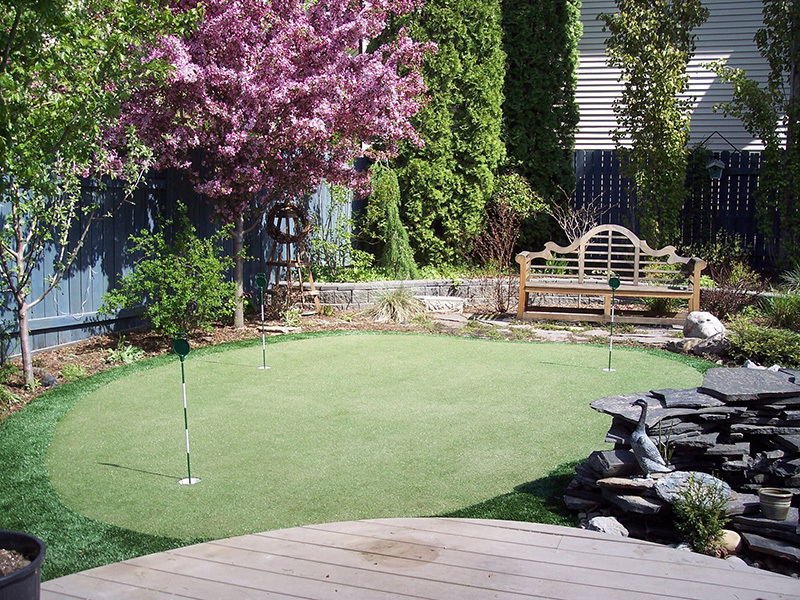 The putting green we had installed is used all summer long and the turf bounces back very well from our harsh winters. 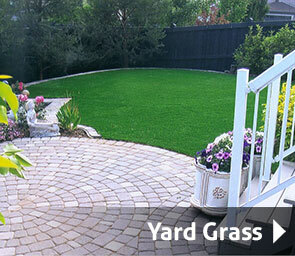 If you want a maintenance-free lawn that looks great all the time, I highly recommend Gary and his team at Evergreen. Gary came out last spring to see if I could put turf on my rooftop deck. I had been trying all sorts of landscapers, deck people, handymen and no one ever got back to me, until I called Gary at Evergreen. He came out and told it was possible and I could have it done within the time frame I was looking for as well. 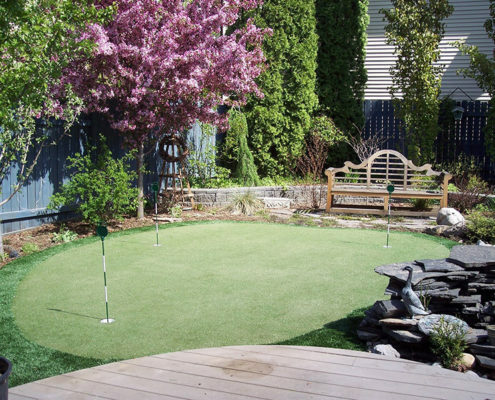 I decided to do a patch of lawn I have in the backyard too and it looks fantastic, while they were here working they repaired the artificial turf I had installed in my dog run, by a landscaper, at no charge. They were all very pleasant to deal with, professional and prompt. I have only great things to say about them and I get tons of compliments on my deck, I love it!